Description: RENTED This 3rd floor apartment is located in the Bahia Azul complex in a central location in the Port of Mazarrón. The secure complex has a gated entrance, communal areas and lift. The accommodation comprises: small entrance hall with bathroom to one side. The bathroom has a walk in shower cubicle, WC and basin. There are 2 bedrooms, one with double bed and a second bedroom with twin beds. The open plan living and dining area has plenty of seating, with sofa and dining table and chairs for 4 people. Patio windows lead from the living area onto the terrace, which has a patio set for dining outside and views over the communal pool. The galley kitchen is well equipped for a self catering break and has oven, hob, washing machine, fridge freezer, kettle and toaster. The complex is in the centre of the town, close to the weekly Sunday market and has a wide range of amenities within a few minutes walk, including the beaches of Puerto de Mazarrón, the new marina, shops and supermarkets, bars and restaurants. Puerto de Mazarrón has a lovely long sandy beach, bars and cafés running the length of the promenade. A tourist train runs around the resort in high season. The water park and zoo at Terra Natura are approximately 35 minutes drive, and the city of Cartagena is also around half an hour away, with museums, marina, shops and Roman heritage site. 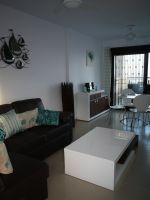 Go karting and bowling are nearby, and the apartment makes a great base for either a family holiday or a longer stay. Pets may be permitted but only by prior agreement. Smoking is outside on the terrace only. This listing has been viewed 9389 times.